The Shooting Star was the first USAF aircraft to exceed 500 mph in level flight, the first American jet airplane to be manufactured in large quantities, and the first USAF jet to be used in combat. Designed in 1943, the XP-80 made its maiden flight on 8 January 1944. Several early P-80s were sent to Europe for demonstration, but WW II ended before the aircraft could be employed in combat. The aircraft was re-designated in 1948 when “P” for “Pursuit” was changed to “F” for “Fighter”. 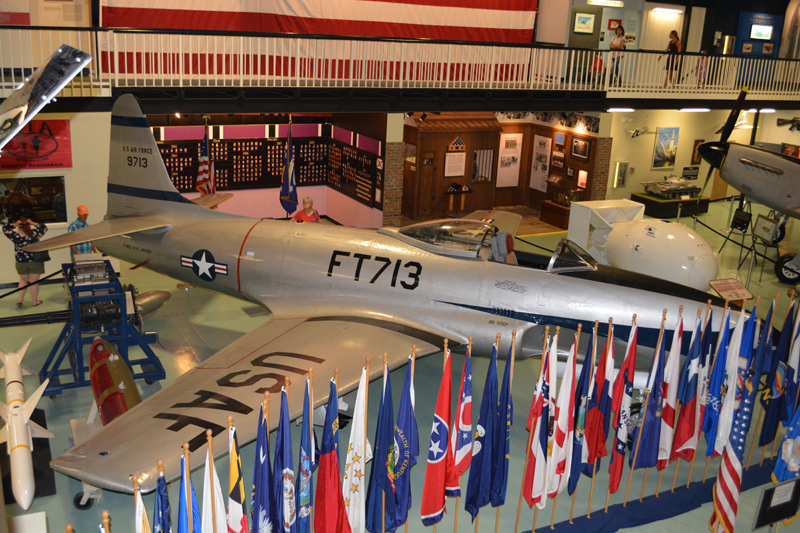 Of the 1,731 F-80s built, 798 of them were F-80Cs. Although it was designed as a high-altitude interceptor, the F-80C was used extensively as a fighter-bomber in the Korean Conflict, primarily for low-level rocket, bomb, and napalm attacks against ground targets. On 8 November 1950, an F-80C flown by Lt. Russell Brown, flying with the 16th Fighter-Interceptor Squadron, shot down a Russian-built MiG-15 in the world’s first all-jet fighter air battle. This F-80C aircraft S/N 49-0432, is painted to depicted Lt. Brown’s F-80C S/N 49-0713 which was assigned to the 16th Fighter-Interceptor Squadron of the 51st Fighter-Interceptor Wing during the Korean War.